Another year, another impact factor and the RSC general chemistry journals, Chem Soc Rev and Chem Comm, are still going strong. The 2010 impact factors were announced by ISI (Thomson Reuters) this week, which showed Chem Soc Rev increase by a whopping 32% to 26.583, and ChemComm continuing to do well at 5.787. The Cambridge Editorial Office would like to thank everyone involved for their hard work and dedication to both journals over the years. In particular, we would like to thank all of our Associate Editors, Editorial and Advisory Board members, authors and referees, without whom none of this would have been possible. If you are interested in how the RSC performed overall then please visit the RSC publishing blog post for the full round up. We are now inviting submissions for this web theme, which will be a celebration of current achievements and future perspectives in this exciting field of research. ChemComm and OBC are both welcoming urgent communications; OBC also welcomes full papers. Please feel free to submit to either or both journals. All manuscripts will undergo strict peer review and should be very important and conceptually significant in accord with the ChemComm and OBC mandates. Publication of the peer-reviewed articles will occur without delay to ensure the timely dissemination of the work. The articles will then be assembled on the RSC Publishing Platform as a web-based thematic issue, to permit readers to consult and download individual contributions from the entire series. Communications for this web theme can be submitted anytime from now until 29th February using ChemComm‘s and OBC‘s web submission system. Please add the phrase ‘organocatalysis web theme‘ in the comments to the editor field. Scientists in China have designed a low-cost copper-amine complex and used it as a template for the one-pot synthesis of a zeolite that exhibits excellent catalytic performance. Feng-Shou Xiao from Zhejiang University and co-workers from Jilin and Beijing Normal Universities, worked together on rationally designing the copper zeolite (Cu-ZJM-1) with changeable Si/Al ratios. The resulting Cu-ZJM-1 has much higher copper content and a better dispersion of copper cations compared to other zeolites reported in the literature. It exhibits excellent properties when it comes to the selective catalytic reduction of the environmentally harmful gas nitrogen oxide (NOx), by ammonia. Download this ChemComm communication, which will be free to access until the 15th July 2011. A new iron carbonyl catalyst efficiently reduces amides using lower catalyst concerntrations, quicker reaction times and lower reaction temperatures, say scientists in Japan. Hideo Nagashima and colleagues from Kyushu University have reported a new heptanuclear iron carbonyl catalyst that can reduce various carboxamides using hydrosilane, 1,2-bis(dimethylsilyl)benzene. This is an important development as the catalyst actually shortens the reaction times, even at lower catalyst concentrations and at lower temperatures, when compared with other reported iron-catalysed hydrosilane reductions. Fancy reading more? Then download the ChemComm communication, which will be free to access until the 15th July 2011. The cyclohexane motif is among the most common in organic chemistry but selectively fluorinated versions are rare. The high polarity of C–F bonds can influence the conformation and reactivity of molecules, making fluorinated molecules high on the target list of many chemists, including David O’Hagan at the University of St Andrews, UK. His team have managed to make 1,2,3,4-tetrafluorocyclohexane, the first example of a cyclohexane with more than two vicinal fluorine atoms. The all syn stereochemistry forces two of the C–F bonds into 1,3-diaxial orientations. This diaxial interaction makes the molecule polar, which O’Hagan suggests could make it a novel polar structural motif for organic materials. Find out more: download O’Hagan’s ChemComm communication for free until 28th July. Scientists are a step closer to understanding how an important cell organelle works, which could lead to new insight into disease such as diabetes and Alzheimer’s disease. The endoplasmic reticulum (ER) plays a critical role in protein synthesis and transport. Its malfunction can lead to serious diseases so it is important to be able to observe how it works. Yukio Yamaguchi and colleagues at the University of Tokyo, Japan, have managed to selectively label the ER in live cells using quantum dots (QDs). Although organic dyes have previously been used for this purpose, Yamaguchi’s QDs are less toxic and more photostable. The QDs’ photoluminescence enabled the team to view the ER using a confocal microscope, making them a powerful tool for long-term real-time observation of the ER, Yamaguchi says. Find out more by downloading the communication. Hydrogen is seen by many as the energy to fuel the future of the automotive industry. But its low polluting profile and high energy efficiency are currently overshadowed by the technical difficulties in developing safe and efficient storage strategies for mobile applications. Alternatives to the common high pressure tanks have been looked for over the years and some promising results came from the use of metal hydrides, formic acid, carbon nanotubes, metal organic frameworks (MOFs) as storage supports. MOF research for hydrogen storage is a young field, established in the early 2000s when reports of the application of these porous materials started to appear in journals such as Science (Science, 2003, 300 (5622), 1127-1129 DOI: 10.1126/science.1083440). After the first proofs of concept, research has moved on increasing the hydrogen absorption capabilities of these materials by screening different metals, organic linkers and fabrication techniques. The group lead by Champness and Schröder at the University of Nottingham, not new to the field (Angew. Chem. Int. Ed. 2006, 45, 7358 –7364, DOI: 10.1002/anie.200601991; Nature Chemistry 1, 487 – 493 (2009), DOI:10.1038/nchem.333), has recently focused on the development of two new scandium(III)-based MOFs that exhibit promising hydrogen absorption qualities. The novel materials, based on the general formula [M2(μ2-OH)(OCR)4)], were characterised and their performance as storage supports tested. The novel MOFs, NOTT-400 and NOTT-401, share the same metal-based fragment as building block and differ from each other by the organic linker employed (H4BPTC and H2TDA). They retained high crystallinity up to 500 °C and 350 °C respectively and were successfully reacted with acetone and degassed to afford the fully desolvated material ready for use. The hydrogen absorption capabilities were tested at 77 and 87 K at hydrogen pressures ranging up to 20 bar with a maximum absorption of 4.44 wt% at 20 bar for NOTT-401. The absorption kinetics showed a very fast intake, reaching equilibrium in about 3 minutes, and good reversibility. No hysteresis was observed. Chinese scientists have reported dumbbell-shaped nanoparticles capable of detecting cyanide concentrations as low as 4 x 10-7 M in drinking water. This low detection limit, which is below the acceptable limit advised by the World Health Organization, is attributed to a combination of fluorescence detection with a filtering process called ‘magnetic concentration-washing’. The toxicity of cyanide and its potential prevalence in drinking water has made easy detection of cyanide an active area of research. 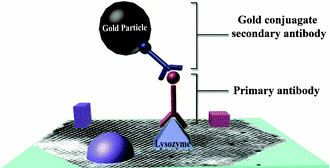 Gold nanoparticles have attracted attention as cyanide sensors due to their selectivity for cyanide over other anions. Now, Shaojun Dong and colleagues at the Changchun Institute of Applied Chemistry, Chinese Academy of Sciences, have adapted a bifunctional nanoparticle made up of Au and magnetic Fe3O4 nanoparticles for sensitive detection of cyanide, even in the presence of interfering species. The group detected cyanide by relying on what is known as the ‘inner filter effect’, observed when two molecules present in a solution have overlapping absorption and emission wavelengths. The fluorescence emission from a fluorophore is blocked, or reabsorbed, by the second molecule, reducing or even quenching the overall fluorescence of the solution. In the present system, the excitation and emission energy for the fluorophore Rhodamine B is quenched by the Au-Fe3O4 nanoparticles. However, addition of cyanide to the sample reduces the gold component of the nanoparticles by forming an Au(CN)2– complex. This change in the structure alters the nanoparticles’ absorbance spectra and the Rhodamine B emissions are no longer fully absorbed. The team calculated the amount of cyanide present in a sample by monitoring the change in fluorescence. To extend this detection method for use with environmental samples, which may contain dyes or other contaminants that absorb or emit at a similar wavelength to Rhodamine B, Dong and colleagues implemented a ‘magnetic concentration-washing process’. In it, the Au-Fe3O4 nanoparticles are magnetically separated from the sample solution after they have reacted with any cyanide present in the sample. This magnetic separation retains the bifunctional nanoparticles and leaves any interfering species behind. Pure buffered water containing additional Rhodamine B is added and the fluorescence is monitored. The authors showed that two cycles of this process were enough to remove any interfering species and accurately detect cyanide levels. Posted on behalf of Patricia Pantoș, web writer for ChemComm. Human lysozyme on mesoporous silica (SBA-15) has been visualised in 3D, say scientists in Italy. Maura Monduzzi and her co-workers at Università di Cagliari, used an immunochemical method to investigate the location of human lysozyme molecules loaded onto SBA-15. Using post-embedding immunogold staining and transmission electron microscopy results in a 3D reconstruction and shows that the protein molecules were located on the external and internal surfaces of the mesoporous silica. This result may have important consequences in biocatalysis and applications requiring sustained drug release. Want to know more? Then download the ChemComm communication, which will be free to access until the 15th July 2011. Making new n-type materials for bulk-heterojunction solar cells (BHJ) can be achieved by simply modifying the fullerene framework, say scientists in Japan. The BHJ solar cells may be an alternative to conventional silicon-based solar cells, if the low power conversion efficiency can be overcome. Yasujiro Murata and colleagues from Kyoto University have shown that structurally manipulating the C60 skeleton is a promising approach for creating better acceptor materials for BHJ solar cells. This new approach means that the team can effectively control the lowest unoccupied molecular orbital (LUMO) level of the C60 pi-system, resulting in a clear improvement in open-circuit voltage – a promising development. Fancy finding out more? Then download the ChemComm communication, which will be free to access until the 15th July 2011. 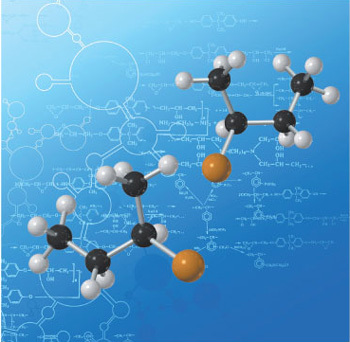 You are currently browsing the Chemical Communications Blog blog archives for June, 2011.